Moscow has been the capital of Russia on and off for 1,000 years. For the last three centuries it has competed for the title with St Petersburg. Today it is firmly the capital of the Russian Federation. Even Vladimir Putin, born in the city of Peter the Great, has not been able to change things. Moscow is the political, economic, cultural, religious, financial, educational and transportation centre of Russia. It is a friendly multinational city where the locals will even offer seats to elderly journalists. This sometimes happens on the London Underground too. Visiting Moscow is a pleasure, particularly in the spring and autumn. It can be very hot in August and as both Napoleon and Hitler discovered winter is extremely fierce. And now easyJet has arrived, a one-class airline, and something rather different. EasyJet is no longer a budget carrier. Air bridges are the norm where possible. The cabin staff are top class. The only recognisable difference with a legacy operator is that you pay for what you eat. That way the flight is cheaper and you have proper choice. Take the easyJet Traveller magazine with you from the seat pocket. Its Moscow introduction is first class. And just to make the quality point easyJet Holidays has on offer a two-night stay in April starting from £132 bed and breakfast in a 3-star property, and £550 at the superb Ritz Carlton. Not a budget hotel! Flights included. 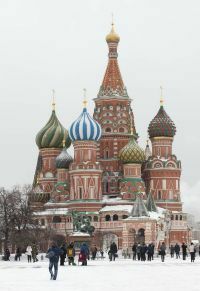 Getting a visa is expensive (the Russian Tourist Board has a first class service that costs £115 – there are cheaper offerings around) and means losing your passport for up to 10 days! 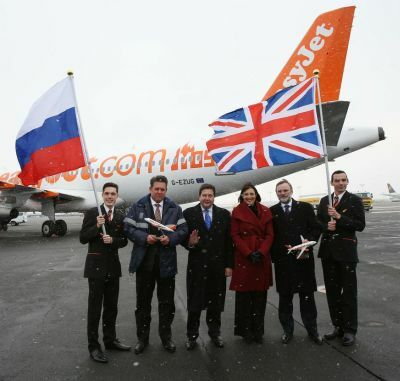 Domodedovo is now Moscow’s major airport and the easyJet destination from Gatwick. 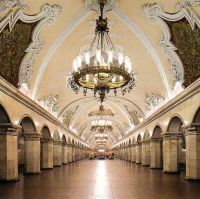 There is a direct train service to the Moscow Metro system. 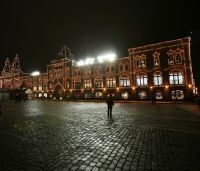 Say Moscow and the first reaction is the Kremlin and Red Square. Sited by the Moscow River they dominate the city. One must also mention what now forms as some kind of memorial to the Stalinist era, the Seven Sisters skyscrapers, built in an elaborate combination of Russian Baroque and Gothic styles using (stolen) American technology. They are massive. The Hotel Ukraina – Radisson Royal, Kotelnicheskaya Embankment Apartments, The Kudrinskaya Square Building (apartments), Hilton – Leningradskaya Hotel, The Ministry of Foreign Affairs, Moscow State University (high on a hill overlooking the Olympic Stadium and the city), The Red Gates Administrative Building. The Kremlin (which means castle – other Russian cities also have Kremlins) is a combination of 18th century towers, churches and palaces, with plenty of Soviet 20th century additions. It is steeped in history. Visit the Armoury, much more than a museum of weapons, a very visible exhibition of the wealth of the Tsars including their wedding gowns, thrones, vestments and jewels. The state coaches are on display, some made in England. It is all mind-boggling. Moscow is full of museums, galleries and exhibition halls catering for all tastes. The Pushkin State Museum and adjoining Museum of Fine Art are close by the Kremlin. There is a museum of modern history. Of the churches that survived the Bolsheviks many are museums including the remarkable St Basil’s Cathedral at one end of Red Square. Stalin ordered it to be pulled down and then changed his mind. It is one of the great symbolic features of Russia. There are a number of military museums including one dedicated to the Great Patriotic War (WWII). The Armed Forces Museum is housed in a fine Soviet style building but the outside exhibition is very disappointing unless you are into tanks. The aircraft collection is incomplete and poor compared with say Duxford or Cosford. However Moscow shares with the former Shropshire RAF base a Museum of the Cold War – Bunker 42 (which we will report on in a later edition). The GUM department store in Red Square is the embodiment of the communist style of socialism. It is a cross between London’s Burlington Arcade and Harrods featuring quality brands. The top rankers lived like the royalty of old. The building itself dates from 1890 and comprises of three galleries linked together and covered. Taking tea in one of the coffee shops can be very expensive. The Bolshoi Theatre rebuilding was finally completed 18 months ago but is again mired in controversy and scandal, not this time over construction. Tickets are not easy to come by. However don’t be put off in terms of music and ballet, there is still always a fine selection of offerings. Moscow also has the world’s largest puppet theatre and a traditional circus. Most of the major hotel brands are represented in the city. However the small owner/occupier refurbished town houses that exist in London, Paris and other European cities, for the most part do not exist in Moscow. In Moscow there are two types of taxi. The official ones, which are not cheap, and the ‘gipsy’ operators, usually normal citizens just trying to exist in a costly world, having a requirement for going from a to b and happy to collect extra funds. You can bargain, and it is the norm. However, whilst Moscow is safe it is advised that women do not use these ‘cabs’ by themselves. Easily the best way to get around in Moscow is the splendid Metro. Opened in 1935, it is well known for the ornate design of many of its stations which contain outstanding examples of socialist realist art. On a normal weekday the system can carry up to 7m passengers. The London Underground was the inspiration with management helping in the design. An escalator was purchased for the first line, and then copied. Whilst the signs are in Cyrillic script travel should prove no problem. Eating in Moscow is a delight as befits an international city. It is reputed to host 6,000 restaurants. Count Stroganoff came from St Petersburg but his dish is available everywhere. Russian food is hale and hearty. It really is a requirement for the cold winters. The Petrovich jazz cellar plays trad, including the late Kenny Ball’s “Midnight in Moscow”. Moscow should be on everyone’s list of places to visit. Three days would be a minimum. It is easy to visit now.